Zombies and vampires and ghosts....oh, my! From fae assassins to subjugating the dead, Strange and Lovely is a collection of short stories that seamlessly blends spine-tingling chills and swoon-worthy romance. This young adult paranormal anthology of supernatural creatures from ten talented authors serves up short stories with heart-stopping storytelling that will haunt you long after you've put it down. Open the pages and discover worlds colliding and struggles for life and love. You’ll find a tale of a young incubus desperately fighting his nature (and diet) alongside Ashley who has a choice—run from the vampires who will stop at nothing to kill her, or become one of them. Dipping deep into romance you’ll find enchanting assassins too beautiful and deadly, and a touching tangle of a love story between an angel and a mermaid both struggling to make their love last. This book will be sure to make you believe that even in the darkest of nights love can find a way. If you love tales of paranormal romance or supernatural thrills but can't decide which ghostly or otherworldly creature to focus on, this is the perfect book for you. Best-selling authors such as Jenni James, Amber Argyle, Stephanie Fowers, and Cindy M. Hogan craft thrilling new stories filled with engaging characters, while others, like Christine Fonseca, Jennifer Griffith, C. J. Anaya, Jennifer Bryce, M. Leigh Marrott, and Rebecca Gage, explode off the page with unique takes on familiar supernatural favorites. Whether humorous, suspenseful, or romantic, the stories in Strange and Lovely will leave you feeling wickedly entertained. Rebecca Gage is actually the mastermind behind the anthology. 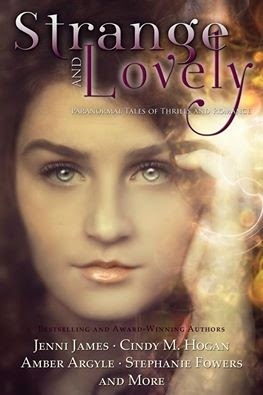 She contacted C J Anaya through Facebook and asked if she would be interested in joining a YA paranormal anthology. Anaya was truly excited to work on anything with Rebecca, and suggested they include Jennifer Griffith, a favorite author of Anaya's. Rebecca was able to get Jenni James on board, and Jenni suggested Stephanie Fowers and Amber Argyle. It simply grew from there. They've enjoyed getting to know each other and their fantastic writing styles. Each story contributes something wonderful and exciting for this anthology.